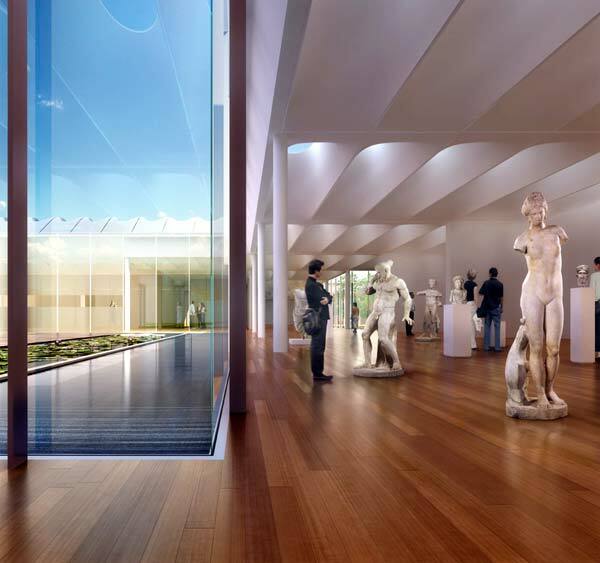 This October, the North Carolina Museum of Art (NCMA) will break ground for a $138 million expansion on its 164-acre campus in Raleigh, NC. New York City-based Thomas Phifer and Partners has designed a new 127,000-square-foot building to house the institution’s impressive permanent collection that spans more than 5,000 years, from antiquity to the present day. When completed in 2009, the graceful, single-story Phifer pavilion will be a long, low rectangular volume clad in a seamless skin of satin finished stainless steel that appears to dematerialize into soft reflections of the landscape, topped by a “flying carpet”-like skylit roof plane. 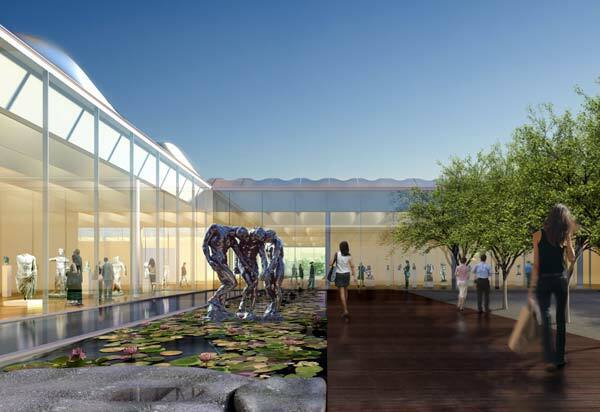 The new building will add 45% more exhibition space for the museum’s permanent collection, including more than two dozen Auguste Rodin sculptures donated in 2005 by the Iris and B. Gerald Cantor Foundation, along with a museum store and café. Berkeley, CA-based Peter Walker and Partners is designing gardens and outdoor galleries as a landscape for art and artist-conceived environmental projects. 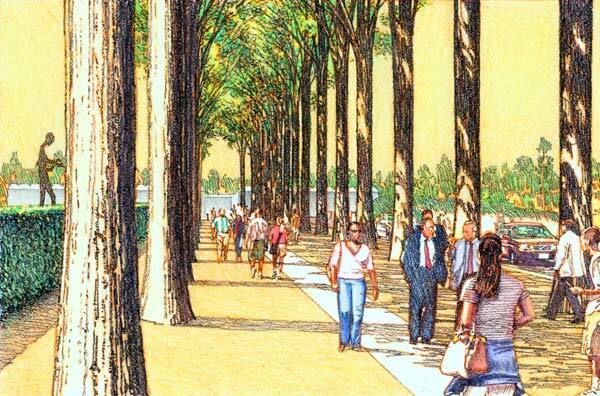 The campus will be the nation’s largest art museum park, with walking paths, bike trails, and site-specific commissioned works in a rolling green landscape fringed by pine woods. 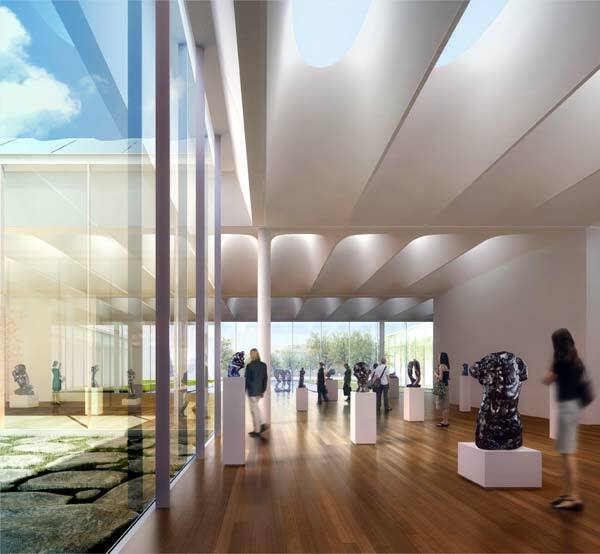 The expansion will also transform NCMA’s existing 1983 Edward Durrell Stone building into a center for temporary exhibitions, collections management, education, and administration. 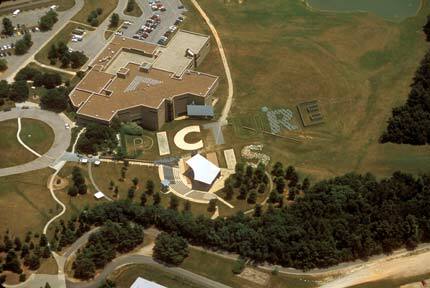 A dramatic garden entry plaza will unify the composition of new and existing architecture with the NCMA’s landmark outdoor amphitheater created in 1997 by Smith-Miller Hawkinson Architects with artist Barbara Kruger. NCMA narrowed an initial list of approximately 30 architects to three firms: Tokyo-based Arata Isozaki & Associates; Thomas Phifer & Partners; and Weiss/Manfredi Architects, both of New York City. 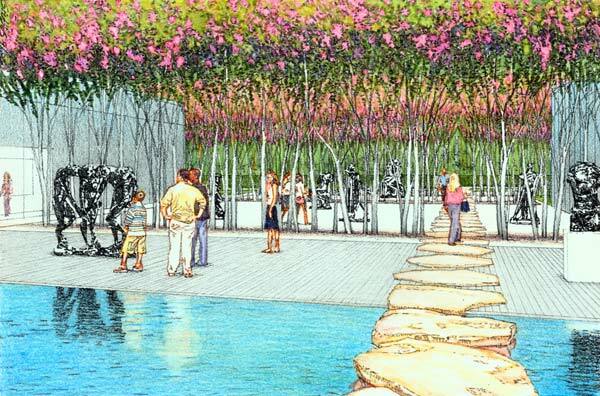 Local executive architect for the project is Pearce Brinkley Cease + Lee Architects of Raleigh, N.C. 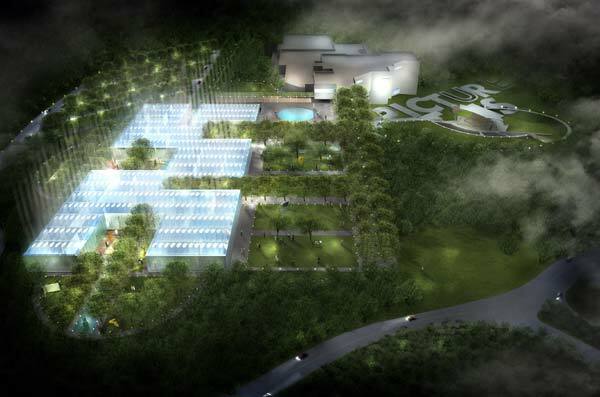 Working in collaboration with Peter Walker and Partners is the local firm of Lappas + Havener, Durham, N.C. 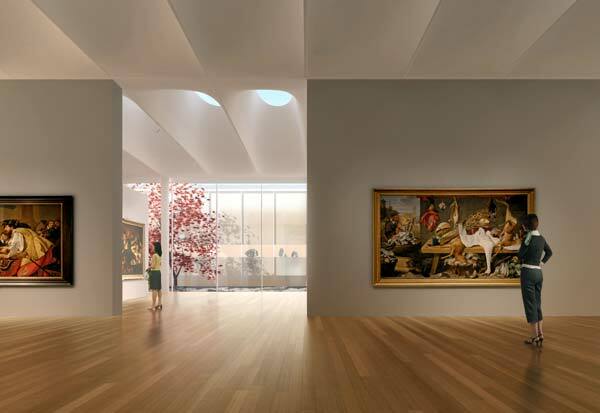 The 26-foot-high building will house permanent collections galleries and public spaces, and a level below ground will support back-of-house functions and a sub-grade connection to the existing Stone building. It is designed to “sit very, very softly and gently upon a natural carpet,” according to Thomas Phifer, AIA. The structure will appear as a single, softly luminous volume that merges with the landscape by abstracted reflections of land and sky on its lightly shimmering surface. “Instead of using glass we are investigating how steel – the ultimate opaque material – can actually be used to create an ethereal effect,” Phifer explains. 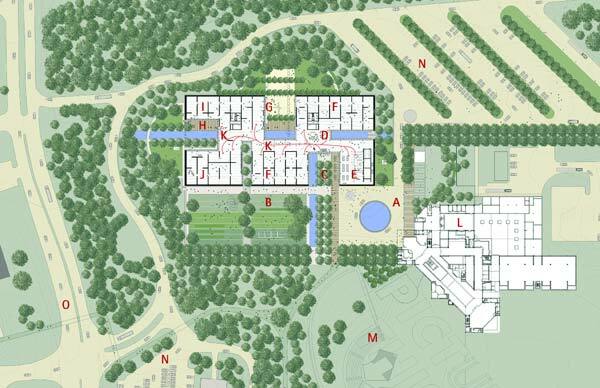 Visitors will be drawn into the building by a double allée of upright trees in a 5,650-square-foot entry courtyard with an outdoor “porch garden” designed by Peter Walker, FASLA. 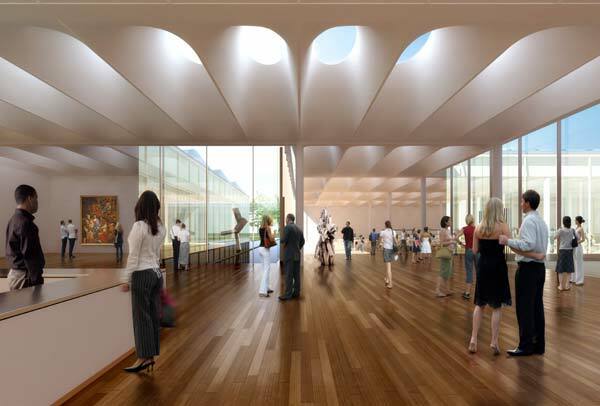 Emerging from this garden into the open, light-filled Front Hall, visitors will have a clear view of art installed in the long Central Hall of the permanent collections galleries beyond the visitor information desk. Here, as throughout the entire building, daylight will create a soft, constant glow. Garden Galleries – outdoor volumes that push into the pavilion from the perimeter – will also draw in natural light – and offer views to the landscape beyond. 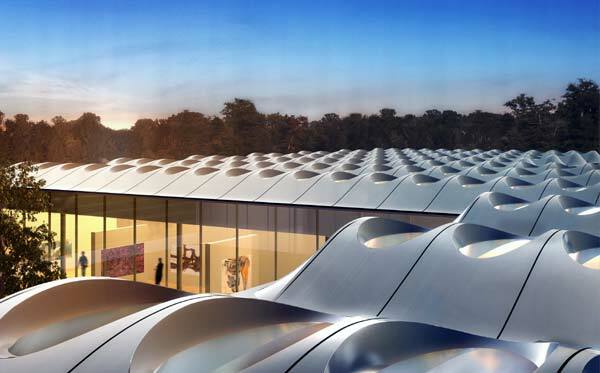 The undulating “flying carpet” roof line will echo the surrounding hills. A system of rhythmic vaults and coffers developed by the Phifer office in collaboration with lighting consultant Fisher Marantz Stone of New York and daylight engineers at Ove Arup of London, bring nature inside the entire building by capturing daylight through highly-engineered, glass-enclosed occuli. A unique system at the skylight glass in each oculus controls the light falling through the coffers. Elements within the glasswork can be dialed up or down to block, filter, and softly direct the light that is allowed into the galleries. 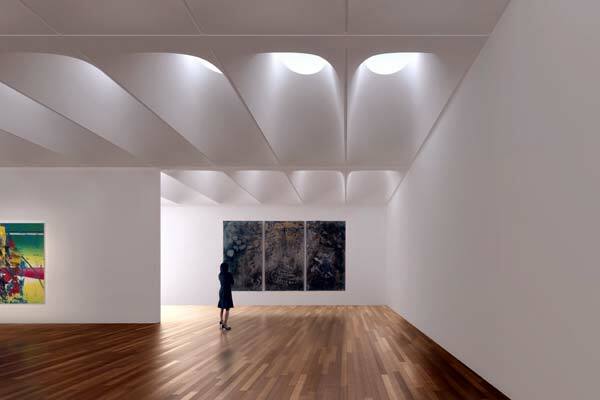 With white oak floors and pale, plastered, 16-foot walls throughout, more than 65,000 total square feet of exhibition galleries will be suffused with controlled natural light and supplemental artificial light as needed. Founded in 1997, Thomas Phifer and Partners has designed numerous residential, commercial, and institutional buildings, including the Steelcase Workstage 001 Building, a high-technology prototype office building in Grand Rapids, Michigan; a new United States Federal Courthouse in an historic district of Salt Lake City; the Arizona State University Gateway Project; and restoration and expansion of Castle Clinton Federal Monument at the Battery in New York City. The firm was chosen by the Mayor’s Office of New York City in 2005 to redesign the city’s streetlights. Peter Walker and Partners was founded in Berkeley, CA, in 1983. The office has joined with renowned architects to create significant projects around the globe. Among these are the Clark Center for Biomedical Engineering and Sciences and the Center for Clinical Science Research (Palo Alto, CA) with Norman Foster and Partners; Nishi Harima Science Garden City (Japan) with Arata Isozaki and Associates; the IBM Solana Campus (Westlake/Southlake, TX) with Mitchell/Giurgola Architects and Ricardo Legorreta Architectos; Toyota Municipal Museum of Art (Japan) with Yoshio Taniguchi and Associates; and the Nasher Foundation Sculpture Center (Dallas) with Renzo Piano Building Workshop. 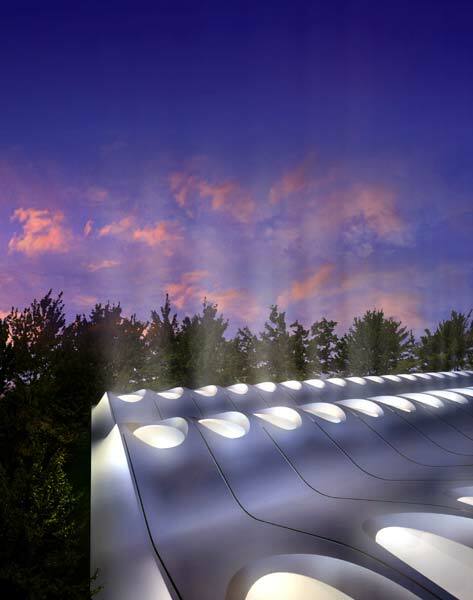 Over the years the firm has received many awards and won numerous design competitions, including the World Trade Center Memorial in New York City with Michael Arad. Founded in 1945, the Raleigh-based Pearce Brinkley Cease + Lee offers a range of services that includes strategic planning, space planning, and programming; urban, architectural, and interior design; project management; and construction administration. A major component of the practice has been the design of college and university facilities, with more than 30 academic projects completed over the past six years. The firm is an active member of the United States Green Building Council and has 19 LEED accredited architects on its professional staff. 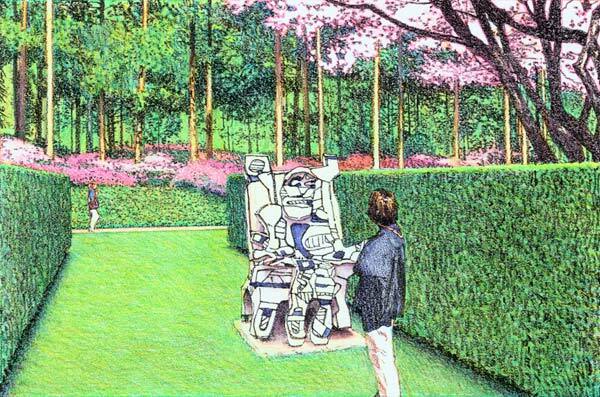 Founded in 1993, Lappas + Havener, PA, is a 14-person landscape architecture firm based in Durham, NC. The firm specializes in the design of public places and is known for master planning and site design for museums, universities, corporations, healthcare facilities, and civic spaces. 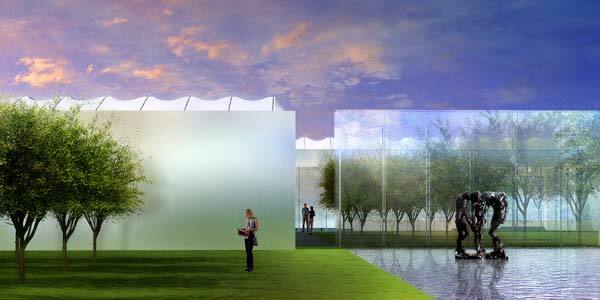 A primary focus of the design work at the firm is creation and enhancement of the academic environment.